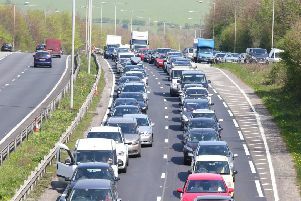 The condition of major roads in Brighton and Hove is improving, according to the Department of Transport. Nine per cent of Brighton and Hove’s 28 miles of council-run A roads were judged to be in need of maintenance, only 2.5 miles. In the previous 12 months, 11 per cent of A roads, or 3.1 miles, required maintenance. The data also shows that five per cent of the B and C roads were in need of work. In total, there are 352 miles of minor roads in Brighton and Hove. Despite the improvement Brighton and Hove has the worst A roads of any area in the South East. The figures also show that road conditions are worse than they were five years ago, when six per cent of Brighton and Hove’s A roads were likely to be in need of repairs. However, the condition of unclassified roads has improved, as from April 2012 to March 2013 20 per cent of minor roads required repairs. These statistics only refer to Brighton and Hove’s local authority run roads.